This an edited version of a blog post by Mike Badger that first appeared at Mother Earth News. When a person approaches the APPPA booth at a trade show or calls the office is, one of my routine screening questions “Are you raising poultry on pasture now?” Many times, I get an affirmative response, but the person substitutes free-range for pasture. I know you may not see the problem. Who can argue with free-range? But I’m not a member of the American Free-range Poultry Association. And there’s good reason for that. The commercial poultry industry's (including organic) implementation of free-range is anything but ideal, and it typically violates the visual of a flock of chickens foraging across an open range. It has about as much meaning as the “natural” label. The marketing problem of pasture-raised versus free-range is a very simple one, and people who produce poultry and people who eat poultry should do well to understand the nuances. Free-range is a USDA label which basically means the birds have access to the outdoors and consequently they aren’t raised in cages. That’s a broad definition, and it’s abused by the large poultry integrators with a government sanctioned production loop hole. Free-range implies a bird on range or pasture, but pasture or outdoors is not actually required or enforced. This is a fundamental deceit in the free range organic chicken, turkey, or eggs that you buy from commercial poultry brands. For the broiler nutritional study APPPA conducted in 2013, I sampled a non-organic free-range CAFO broiler along with another free-range organic CAFO broiler for some comparative numbers. There were several key differences compared to the pastured samples. The pastured samples showed elevated levels of vitamins D and E, whereas the free-range samples were negligible. Depending on the feed type, the pasture-raised samples had an omega 6:3 ration of 3:1 (non-soy feed) or 8:1 (soy feed) compared to 11:1 for the two free-range CAFO samples I purchased for the test. Vitamins D and E and the omega profiles are a few of the often-cited differences in grass-based production systems. Going through the expense and labor of producing small flocks on pasture demands a different descriptor than the watered down free-range reality. Joel Salatin gave us that label in the 1990’s. It’s called pastured poultry, and it embodies the difference between the CAFO chicken and the local pasture-raised kind. I typically boil pasture-raised down to a very simple idea. The birds move through the green grass (pasture) frequently and in a deliberate way. The best way to ensure you get what you want is to shop someplace where you can ask the farmer questions because relying on a label alone to authenticate your purchase can be a deceiving game. 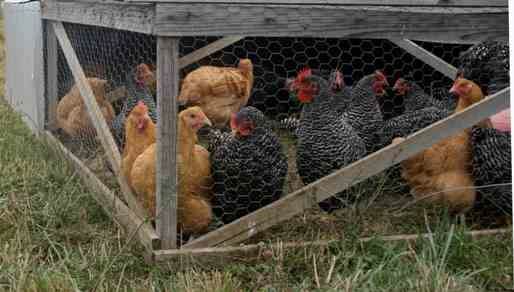 I’d recommend you look for pastured poultry farmers in your community. Pastured poultry will live a majority of its life on pasture and will be rotated to fresh green grass in a managed (i.e., deliberate) way that benefits the bird, the land, the community, and the eater. Ask for pasture-raised. Find a farmer near you.